When I saw park was going to be open Tuesday and Wednesday after Labor Day, I was hoping I could get there one of those 2 days since I went on the Tuesday after Labor Day last year and it was empty. Just like last year, today had very low crowds. I got to the park around 2:30 and driving past Hurricane Harbor, it didn't look too crowded and Hurricane Mountain was closed. I saw Superman had a crane near it with neither train in the station. On the closed rides board, besides Superman, Saw Mill Log Flume, Congo Rapids and Runaway Mine Train were listed. Nitro was first with the A and B train running. It was a station wait and was a great ride as usual. I walked around for another ride and then went to The Dark Knight since I saw the pre-show door was open. It was very uncomfortable in the pre-show room because of how hot it was and since there was no one waiting after the first ride, I was able to get a re-ride. I skipped Batman for now and went to Skull Mountain getting 4 rides just having to change seats twice and stopped at Blackbeard's since they were loading the train. The Flash Pass booth was closed and this is the first time I have been to the park since getting a season pass and not seeing Flash Pass being used at all not counting season pass nights. Normally even when the park isn't crowded at all, they still offer Flash Pass for the few people that want to use it. I went to the Tea Cups on the way to the other side of the park and saw the Log Flume was drained with no ride vehicles in the station so it might be done for the season. Bizarro was running 2 trains with the fire working and Auger of Doom mist working. I got a re-ride and went to Kingda Ka. There were 2 trains running with a 2 train wait for any row except the front. They were having problems with the restraints which took a couple of extra minutes. Someone working at Bizarro said Runaway Mine Train was closed to make it smoother and if it is having track work done, I wonder if it will be closed the rest of the season. Ever since Zumanjaro was announced I was unsure if I was going to try it or not and decided to go for it since with low crowds, I wouldn't be standing in line thinking about the ride. There was about a 2 minute wait and I got gondola 3. The restraints were very comfortable and while climbing the tower, it didn't seem as scary as I was expecting. The drop also wasn't as intense as I was expecting which was ok since it was still a very fun ride. I walked around for another ride again getting gondola 3. I think it was a very good addition to the park and helps round out the park's non coaster ride collection. 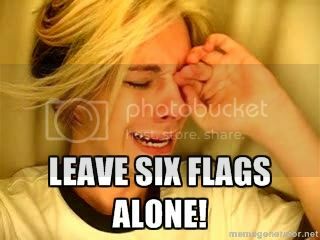 I went back to Kingda Ka for another ride again with a 2 train wait and then to El Toro which had no wait except for the front row and last car. Walking back to the other side of the park I went to Deja Vu and to Batman which had a completely empty station so I went for the front row. Even though I could have re-ridden, 1 ride was enough with how intense it is. I finished the day at Nitro getting 4 rides in a row including 1 front row ride. It was great that the park was open these extra days and I was glad to be able to get so many rides in. Why on earth would they be open two days after labor day? Is school still out in some areas there? Sounds like an ideal time to go. Most schools in the area already are back in session. NYC schools start the next day and Philadelphia starts Monday. It did seem strange that they decided to open the main park, even more strange that they opened up Hurricane Harbor since it isn't even open during the week for most of June when the theme park is on daily operations. stopped at Blackbeard's since they were loading the train. Oh no! That ride is UNSAFE. I hope your elbows are ok. I remembered that report when I was walking up the entrance ramp. I'm happy to report there were no injuries. Where are all of the complaints?!?!? Maybe people are afraid to be critical of the park anymore. It was funny the first time you did it. Not so much every time after. Thanks. I was trying to find a funny time to use it, and I realize that my inpatients failed me. Have you tried a shady location, plenty of water, and Miracle Grow? Are you a hospital now, Travis? And what would make people 'afraid' to say something? That's ridiculous.